This week’s Thursday’s Children has come around so fast. Thankfully though I wrote down the idea of what I could write about this week, so unlike some previous weeks I’m a little more prepared. In some ways it’s kind of similar to last week because it’s about something else that’s personal to me. And that is – as the blog post title suggests – faith. I grew up in a Christian family and became a Christian at a very young age. Since then I’ve had plenty of times when I could have thrown in the towel so to speak and decided not to be a Christian anymore. But I didn’t. My faith has kept me going – yes even through the dark times of my illnesses. I believe that God has looked after me throughout my life in so many different ways. Although I’ve been so very ill it could have been so much worse. I’m being successfully treated for my mental health condition and I’m able to lead a normal life. Some people I know of are not so lucky. They are in and out of hospital and while they may not be as ill as I was, they struggle to cope with day to day living. So my faith is hugely important to me. And yes I think it has influenced my writing. I give all my characters the opportunity to grow and change. Whilst I may not give them a faith of their own as such, they all have a sort of moral code that I try to make them true to. My novel The Inheritance which I want to publish soon is loosely based on one of the parables Jesus told, ‘The Prodigal Son’. But as we all know, faith can take many forms. Think of the many religions out there and the many more different interpretations of those religions. In today’s society, in the West, people are free to choose what they want to believe and how to express their belief. Some people believe in God but not Jesus. Others, including Muslims, believe that Jesus was a prophet but not divine. In our Western society many people are agnostic and many are atheists (my husband included). For people who are not Christians/Muslims etc. and do not have a religious faith, I would argue that faith in its barest form is still hugely important. What do I mean? Well to survive in this world, we all need to have a little faith in our day to day lives or we wouldn’t be able to function properly. If you’re a mother you have to have faith that you can send your child off to walk to school with their friends and that they will come back in one piece. If you’re applying for a job and it seems that you’ve been applying forever, you have to ‘keep the faith’ as Bon Jovi sings, to believe and trust that you will get one in the end. Or else you’d just give up, wouldn’t you? What about when your spouse is flying across the Atlantic on a business trip leaving you behind to look after the kids? You’ve got to have faith that he/she will come home in one piece and also that you’ll be able to cope with looking after the kids without them till they come home. Everyone needs a little faith just to get by. And I think faith is also important in our writing. I’ve explained how it’s important in my writing, but how can it be important to everyone’s writing? Well our characters have got to have their own faith in one way or another. It can be a religious faith as mentioned above or it can be basic faith that things will come right for them in the end. A different dimension can be a loss of faith, whether a loss of religious faith or any faith. Perhaps your character has something so terrible happen to them that they can’t believe in a greater good; they can’t believe in anything anymore. Or maybe it’s the other way round: they don’t have any sort of faith but events conspire during the course of your story to force them to reevaluate their beliefs or lack of them, and they end up believing in one way or another when they didn’t before. 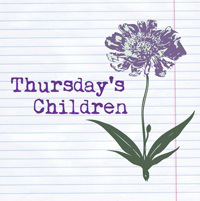 If you would like to join in Thursday’s Children, simply write on your blog about what inspires your writing. It could be anything. Then add your details to this linky. Big thanks to Rhiann Wynn-Nolet and Kristina Perez for hosting. Up until this WIP, religion as such has not been part of my writing because it’s not part of my own life. Yes, I have a belief system, but it’s much more Nature-centric than anything else. This WIP’s MC is obsessed with elements of Catholicism, but doesn’t necessarily believe in God. It seems to me that loads of people have a belief system without really being religious. And there are so many different belief systems out there. Hope you’re getting on OK with your WIP. Your MC sounds interesting. Funnily enough as I said in the post I don’t generally make my characters religious, but I think the influence is definitely there in my writing. Thanks Kate. I agree – as I’ve said above whether or not I write about religious characters, my faith permeates my writing anyway. Thanks for your comment Kristina. I think many people are like you nowadays – in the way that you’re ‘spiritual but not religious’. And it’s great that you’re creating belief systems in your work – I think fantasy lends itself well to have in it a religion or faith of some sort. It can make it more believable. Well ‘treating people how you wish to be treated yourself’ is exactly what Jesus taught! (Love your neighbour as yourself etc.) So I quite agree with you there. As I’ve mentioned I don’t tend to make my characters particularly religious but they all have their own moral codes and I think I would find it hard to write about someone who was completely amoral. I’ve been saying this for a while now, but there are still those who are not convinced that “faith” is not necessarily a religious sentiment. Faith has more than one definition. But some people are blind to that. I don’t understand that mentality. It’s so limiting. Thank you for sharing. Thank you for also proving my point to so many. I agree with you that the definition of faith can be quite broad. I also think that sometimes, certainly in the UK, people can hear the word ‘faith’ and be a bit hostile because they think that it’s referring to religion, when it isn’t necessarily. But at the same time ‘faith’ can often be a better word to use to describe Christianity because ‘religion’ is such a strong stark word and has so many negative connotations for people. Love this post Elaine! I’ve been really going back and forth for a while now if I want to be a “Christian novelist” or just a writer who is a Christian. In some ways, the Christian fiction genre seems a little limiting. On the other hand, faith is such a big part of who I am and it makes sense that this would be reflected in my writing! I’m curious, do you plan to market your work as Christian fiction, or just fiction by a Christian? I like your take on how people can hold basic ideas of faith while not adhering or holding to a specific religion. I also like your addition of the loss of faith as characterization and to show character growth. In one of my stories, my MC faces a crisis of faith. Thank you for sharing and for eloquently connecting the ideas of faith to writing. Glad you enjoyed the post Joan. 🙂 Your story sounds interesting. Is your MC religious or do they have more of a belief system that they adhere to? Wonderful post! I am also a Christian, and am going through a Christian-based publisher with my YA western. I think that my faith plays a big part in my writing. One book is about an outlaw who believes he’s been hung and is a ghost. Through the book he tries to fix his wrong doings so that he can have a shot at heaven.